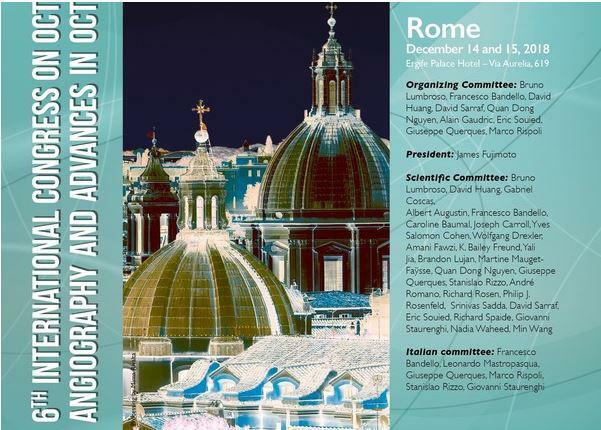 The "6th International OCT Angiography and Advances in OCT Congress" will be held in Rome, December 14 and 15, 2018. It is the largest OCT and OCT Angiography gathering of Clinicians, Scientists, Engineers in the world. This convention allows interaction that is not possible at any other venue and is the most important and largest conference in our field in the world. It will focus on the latest developments in Optical Coherence Tomography, “en face” OCT, and OCT Angiography, large field OCT. It will also delve on other ocular imaging techniques: adaptive optics, widefield imaging. The top world’s experts in retinal imaging will speak on recent advances that have occurred in this rapidly advancing domain. OCTA technology has made a leap forward, the clinicians have better understanding, and the industrial competition is more aggressive and passionate. Clinical applications are easier and faster. OCTA has reached everyday clinical practice. The new techniques help patients and make easier treatments decision. Our speakers will explain the newest evolving technologies and will coach our attendees in the application of these innovative systems and in the interpretation of different and unusual images. Listen to world top experts present the remarkable developments in their respective fields since our last Meeting in December 2017, when more than 1500 clinicians and researchers from around the world came together to discuss new developments. Interact with the best industries exhibiting the latest products and services in OCT and OCT Angiography! Learn, participate, and connect with your colleagues from all over the world! Make new friends, and renew longtime relationships in wonderful and hospitable Rome!